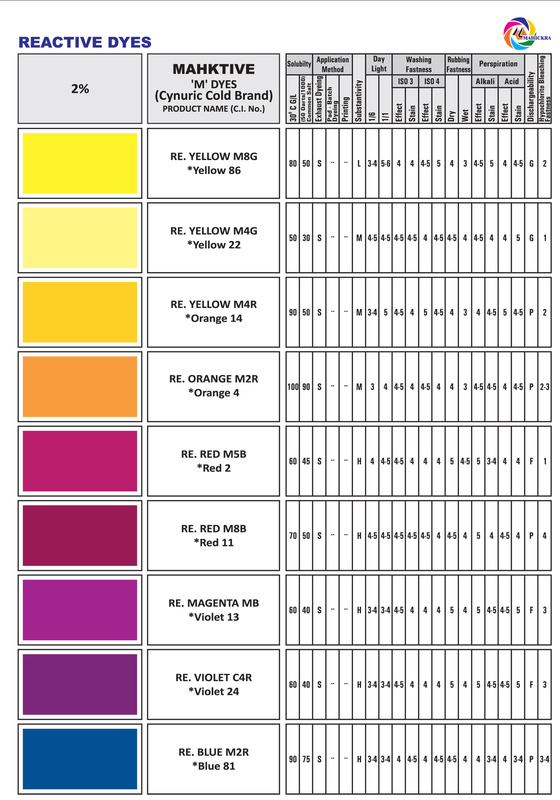 Economic dyes with excellent build up in Deep Shades low recipe costs. Good exhaustion & high Fixation, resultsin low effluent load. Meet the requirement of major ecology standards. 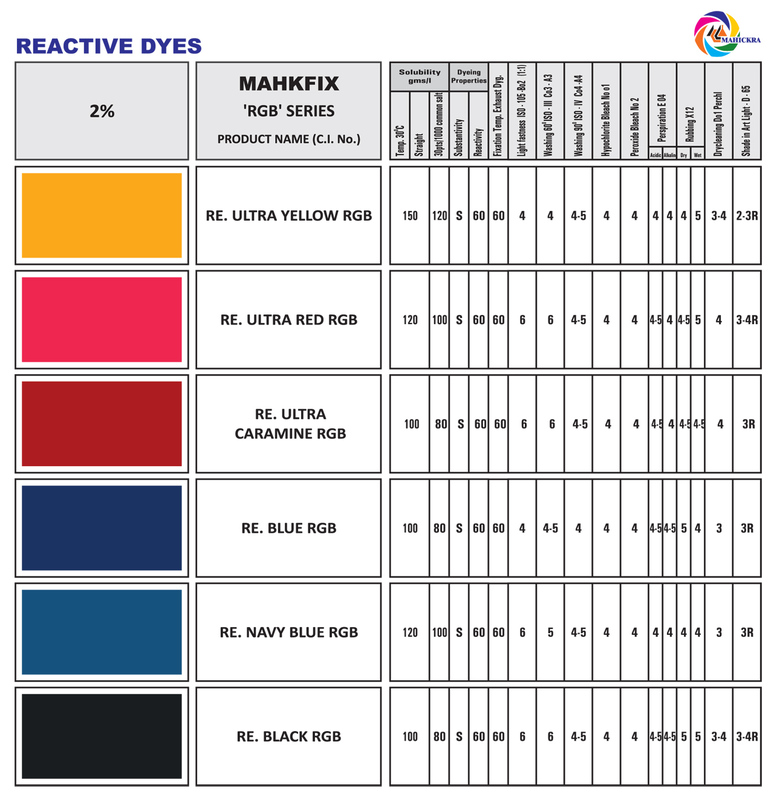 Reactive (C) Dyes are used for cotton and viscose. These dyes react with cellulose fibre to produce very brilliant shades. Due to certain leaving group which can undergo nucleophilic displacement with hydroxyl group of cellulose and thus gives us best results to fastness. Dissolved the dyestuff in water. Add urea and start stirring. Further add water for complete dispersion. Add resist salt (Pre dissolved), Add thickening agent and make a uniform paste. Just before printing, add soda Bi-carb (Pre dissolved) in the above ready paste. Print out the fabric with this paste and dry it steam in ager for 10 to 15 minutes. Wash out with cold water and then boil water and then with soap – hot – wash – cold – wash and dry it. NB : In cold brand, paste can not be stored after addition of alkali. Dissolved required quantity of reactive ‘C’ cold brand dyes in hot water having temperature of 60 -70 C and check that no prescription remains in it. Filter the solution. Mix the solution with thickening help of stirrer and print out the fabric with ready paste. After dying pad the fabric with highly alkaline 48 TW0 – sodium silicate. Keep it in air tight for 20-24 hours. Wash it in continuous water and dry off. “ME” (Medium Exhaust) i.e. BIFUNCTIONAL Dye are low temperature high exhaust Reactive Dyes suitable for Dyeing Padding and printing of all dyes of cellulosic material. 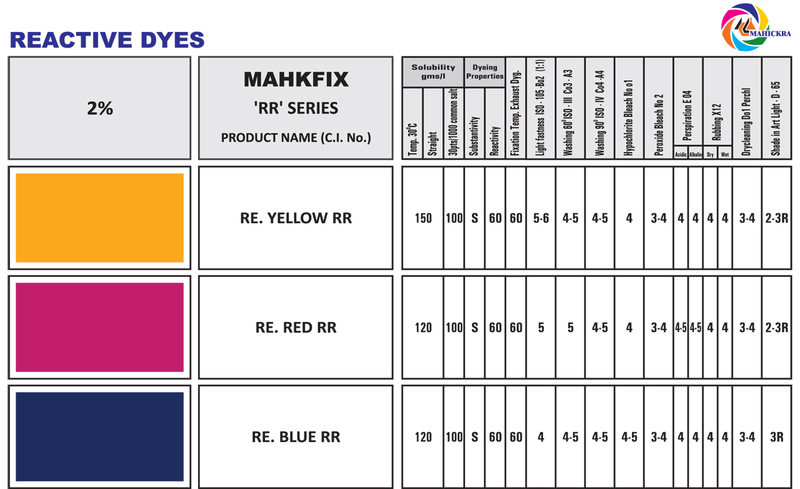 These dyes offer high grade of all round fastness properties.They offer leveling properties and excellent alkalis stability. 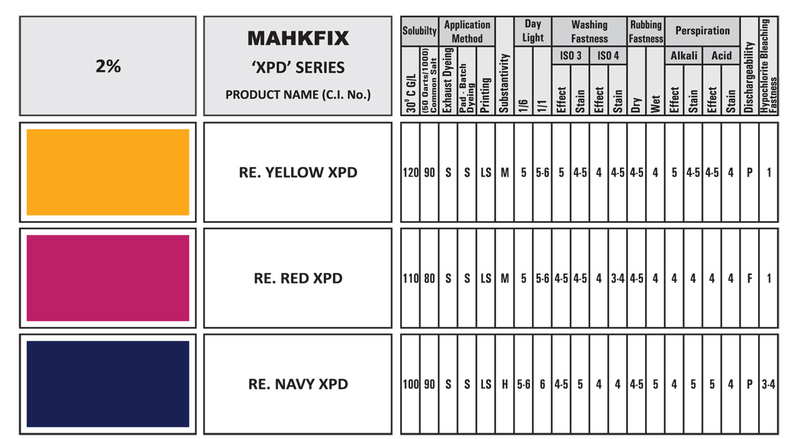 Fixation temperature of these dyes is 60 -45 C.
“P & H” are PRINTING Dye Which are meant for Printing on Cellulose Textiles by both Dyeing as well as Printing Methods. These Dyes are MONO CHLOROTRIAZINE reactive dyes having a low reactivity and low substantivity, Since these dyes have low reactivity, they requre more severe conditions for fixation with cellulosic materials. “P & H” Series dyes react with cellulosic fiber in the presence of alkali and under the influence of heat. They are readily soluble by pouring water of 80°-85° C on powder and stirring well. 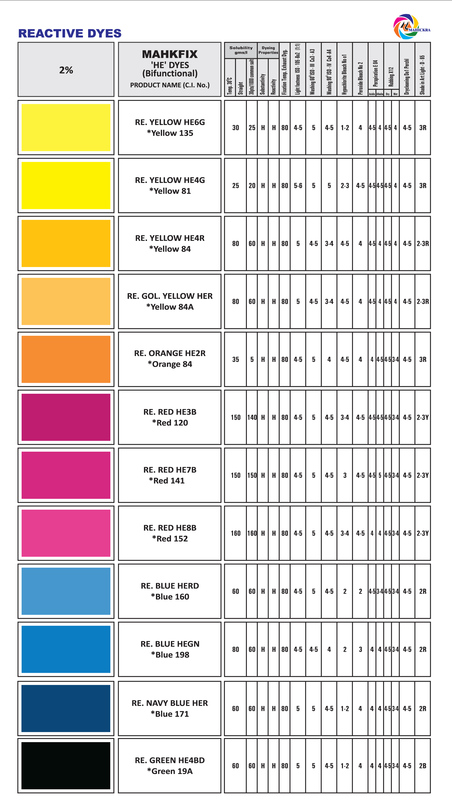 The dyes contains very good fastness properties and suitable for printing cotton, viscose, cuprammonium rayons and natural silk. Mixing pump required : Pad : dye, wetting agent, anti – migrant, mild oxidant, alkali Add Urea to improve solubility. They have higher all around fastness properties.